David Coulter, left, a firefighter and paramedic with the Lima Fire Department, was named Firefighter of the Year by the Lima Noon Sertoma Club during a noon ceremony Tuesday. Coulter is pictured with Lima Fire Chief Bruce Black. LIMA — “I’m a Lima kid. 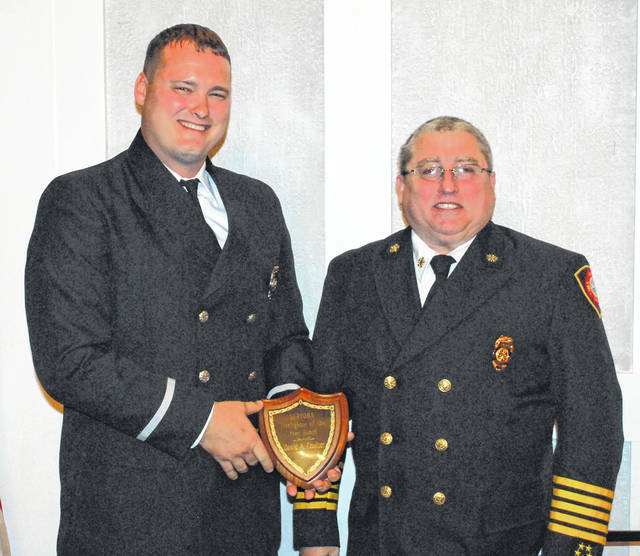 I grew up on these streets, so this award means a lot to me,” Lima fireman David Coulter said Tuesday as he accepted the the Lima Noon Sertoma Club’s Firefighter of the Year award. A firefighter and paramedic with the Lima Fire Department, Coulter was selected to receive the award from among a handful of nominees. Black cited Coulter’s passion for teaching EMS first-responder training courses at Apollo Career Center, Rhodes State College and Lima Memorial Health System as an example of the firefighter’s dedication to making the Lima firefighting force the best it can be. The Lima Noon Sertoma Club has sponsored the Firefighter of the Year award since 1972. The award is presented annually to a Lima firefighter who has performed outstanding service above and beyond their normal duties during the past year. Nominees must exhibit the highest degree of dedication to the fire department and the community and must show loyalty, productivity and professionalism in carrying out their duties, according to a Sertoma spokeswoman. “To be nominated for this award is truly an honor,” Coulter said. “I got this award for doing educational programs, and I feel education truly is important. As a department I think we are on the cutting edge of training and in having the necessary equipment, to the point where I believe our department will be second to none. We will be the envy of area fire departments,” Coulter said. Black said Coulter was deserving of the award and made a prediction of sorts for the firefighter’s future. “Hopefully his career will be full of promotions,” the chief said.